Having a portable induction stove is convenient if you live in a dorm or RV or if if you want to cook when camping. It’s also nice to have an additional cooking device when you have company and your stovetop is already being utilized for other dishes. With an induction cooktop, you can stir fry, braise, deep fry, roast and even boil water. However, not all induction cooktops are created equal. While they do tend to be energy savers, the bad ones are not powerful enough to heat up fast and stay at the selected temperature. Many also create hotspots, so your food may not cook evenly. Our best portable induction cooktop reviews aim to assist you in picking out a good one for your needs. Here are a many more induction cooktops available on Amazon. An important thing to remember is that not all cookware will work on these types of cooktops. Cast iron, steel, and magnetic stainless steel work well, as do many ceramic and enamel pots with an inner iron core, like those from Le Creuset. An easy way to tell is if a magnet sticks to the bottom of the pot or pan, it will work on the cooktop. Do not use aluminum, glass or copper unless it is iron clad at the bottom for use on induction stoves. This small cooktop is as fully capable as any stovetop, and for dorms, RV’s or even if you just want to use one appliance for induction cooking, the full featured Duxtop Portable Induction Cooktop from Secura is the best rated portable induction cooktop you can buy. There are 15 power levels, ranging from 200 watts up to 1800 watts and with that you’ll also get 15 temperature ranges from 140 degrees to 460 degrees. That gives you about as much versatility for cooking that you could ask for. But overall versatility goes further than that. Since it plugs into any 120 volt outlet, and it comes with a 6-foot cord, the longest here, it truly is portable in all respects, yet it is large enough to hold a 12-inch pot or sauce pan. The digital read outs for wattage and temperature is shown on an LED screen, and adjustments are easily made with “plus” or “minus” buttons. The digital timer counts down in 1 minute intervals from a maximum of 170 minutes. No rocket science here, just good and practical controls. There are some cool features like an automatic pan detection alert and a low or high voltage warning, so you know if you’ve set the pan on correctly with the former, or if you should unplug the unit in the case of the latter. If you understand that all induction cooktops must be used with iron or steel pots and pans (although some cladded steel aluminum and copper pans may work too), you’ll be hard pressed to find a better portable induction cooktop for any price. If you are looking for a comparable portable unit that is a bit simpler to use than the the Duxtop, yet still gives outstanding performance, check out the Rosewill Portable Cooktop. You’ll get 8 wattage settings, from 300 up to 1800, and 8 temperature settings, from 150 degrees to 450 degrees. You can also set a timer for up to 3 hours, so a dish that needs to be simmered for a while comes out very well on it. 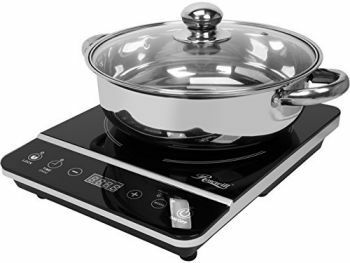 You’ll also pay a bit less for this unit, and if you are new to induction cooking and just want to try it out, this is a very decent and useful appliance for that purpose. They’ll even send you a 3.5 quart pot, with glass lid, so you’ll be good to go as soon as you unpack the item. For added cookware versatility, it has two burner rings on top; one is for 5-inch pots and pans and the other is for 9-inch pots and pans. You could use smaller or larger sizes, but you’ll get hot spots and uneven heating if you do, so it is best to stick to the sizes recommended. It comes with a 4 1/2 foot cord, and also works on 120 volt, making it another good choice for an RV or a dorm room or even outside next to the grill for boiling potatoes while the steaks are cooking. The LED readout is easy to see, and adjustments are made with “plus” or “minus” buttons as part of the touch control panel. This unit heats up very fast and can burn food if you don’t realise how fast it gets hot. A few customers recommend that you start off with a lower wattage setting to test if a higher power level is needed. For a unique design that actually does resemble a round oven stove top, the NuWave PIC Pro will look good in any decor. With 1800 watts, it has the highest temperature rating of them all at 575 degrees – perfect for searing meat, and the LED readout makes it easy to adjust the temp. There are 6 basic temperature adjustments, each of which are low, medium low, medium, medium high, high and max sear, but you can micro-adjust the temperature between these settings too. Once you punch in one of these heat settings, you can then adjust the temperature, up or down, in 5 degree increments. The lowest temperature you can set it to is 100°F and the highest is 575°F. If you are looking for a portable induction cook top with the most precise temperature control buttons, this is the one for you and you can be assured that you’re getting one of the best induction portable cooktop units available today. With a 9.5 inch heating surface, the Nuwave Pic Pro is rated for pots and pans up to 12 inches, so you will be able to tailor your cooking needs by using virtually any sized pot or pan. The Max Burton Digital Choice Induction Cooktop is another fine portable that will give you superior induction cooking. It is also rated at 1800 watts, with 10 wattage settings from 500 watts to 1800 watts, and 15 temperature settings from 100°F up to 450°F, adjustable in 20 degree increments. This cooktop gives you one of the lowest temperature settings, like the Nuwave above, and if you are looking for one that simmers better than the others, you’ll have to seriously consider this unit. However, you’ll only be able to simmer for up to 3 hours before the timer cuts out, but for most simmering duties, that should be long enough. Although it is the most expensive single induction cooking stove top on this list, it has a few features that may make it more practical than the others, There are dedicated buttons for both boiling and simmering, you can use over sized pots and pans, and the temperature levels are very accurate. You may pay more, but for reliable cooking, this one may be the best portable induction cooktop. The Waring Pro Double Induction gives you as close to a regular induction stove top as you can get, with all of the advantages at your fingertips. Overall it has the same amount of power as the others, 1800 watts, but the power is divided between the two burners. The left side has 1200 watts of power, with 8 power levels from 200 watts to 1200 watts, while the right side has 600 watts of power with 5 power levels from 200 watts to 600 watts. You’ll have 8 heat settings on the left side and 5 heat settings on the right side and each burner has its own 150 minute timer. Although considered a portable unit, because of the twin burner design, it is a bit larger and bulkier than the single burner units listed above. However, it is still an excellent choice for smaller places like dorms and RV camping, and if using only one side or the other, you can potentially save more energy during cooking than with the single burner units too. A nice safety feature turns the burner off 30 seconds after the pan is lifted off. It has a fully digital read out with “plus” and “minus” buttons for temperature control, but the lowest setting is potentially not low enough for gently simmering sauces or melting chocolate. Since this is a two burner unit, it is far more versatile than just having one burner. You can cook on both sides at the same time, and prepare an entire meal on one cooktop. Although this unit will cost you more than double of any of the single burner units, if you have a larger family, or just want two burner capabilities, this will be the best portable electric cooktop.